Folks, I need your help. I’m well into the crazy nesting phase of this pregnancy and I neeeeeeeed to have a baby book for when Pickle is born. This cute thing from Tiny Tales, which isn’t a book at all, but a set of cards to prompt you to write down all the milestones. Eventually you’re supposed to add them to a baby book. For me, that means I’d end up with a baby book and this set of cards because I wouldn’t want to throw them out. Does that defeat the purpose or is this maybe exactly what I need? 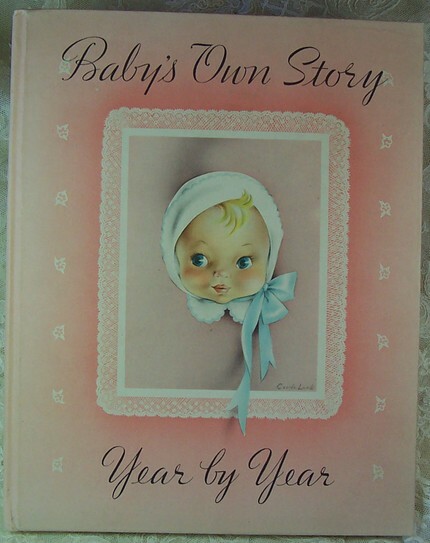 This one is from Needle Traditions, and features a kind of creepy baby doll cover but it also seems rather sweet. Not for everyone since this 1941 version assumes that baby will be celebrating Christmas and not just the “holidays” that we refer to now. But our baby will celebrate Christmas, so it could work for us. Eh? I don’t know. No creepy doll. That says a lot. I don’t know, I’m kind of at a loss, and bordering on just buying several different books. Is that nuts? Is that the hormones talking? Or maybe the handful of candy corn I just inhaled. Where did you all get your baby books/memory books? I need some new ideas. Online sources? Good local paper stores? This entry was posted on Wednesday, October 15th, 2008 at 3:11 pm	and is filed under Misc.. You can follow any responses to this entry through the RSS 2.0 feed. You can leave a response, or trackback from your own site. I love the vintage one, so pretty! As a mother of seven I must say that the Tiny Tales product is pure brillance! I would have loved something like that! 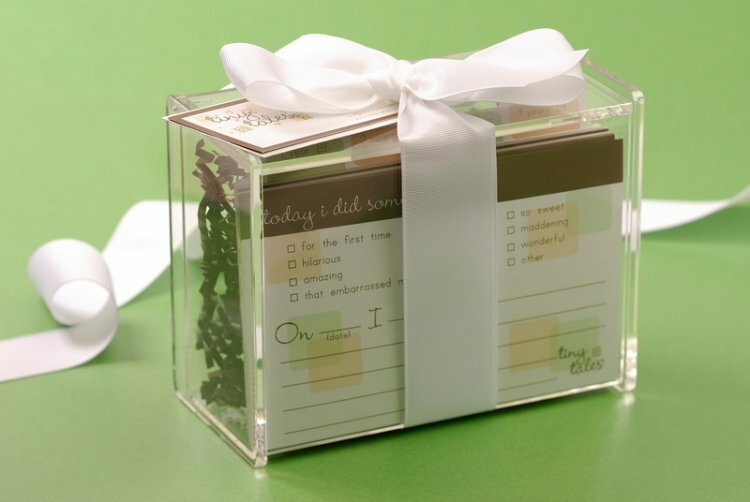 And the fact that the cards are 4×6, it would be so easy to slip them in to a photo album, with coordinating photos. I’m all for the vintage, too– look around for a while, i’m sure you’ll find one that really fits.